The Hypothetical iTablet: What’s Taking So Long? The iPhone and a 5.25″ iTablet, to scale. iTablet mockup from Yanko Design. Interest in the hypothetical Apple iSlate or iTablet — the hybridized descendant of the iPhone/iPod Touch, the Mac and the Newton— never seems to die, as new (or recycled) rumors swirl with the approach of every Apple-sponsored gathering. The iPhone/Touch branch of the Apple family tree is beginning to unfold with new models and a true third-party development environment, so most of the foundations for a multitouch-enabled tablet device are already laid down. Yet, the machine remains forever on the horizon, a mere glimmer in every Apple fan’s eye. Perhaps — as Apple competitors have discovered — the matter of making such a machine usable and polished to Apple standards is far more than a simple supersizing of what already exists. Given what we know about existing machines, it’s instructive to look at what the iTablet/iSlate might be, along with some of the substantial interface issues that Apple will need to solve before such a machine can become reality. The iTablet, based on a rendering posted at TechEBlog. The iTablet will likely follow the evolving design themes emerging from Cupertino, continuing the convergence toward aluminum and black that characterize recent Apple machines. The critical acclaim and hotcakes-like acceptance of the MacBook Air guarantees that slimness and lightness will be a priority, and by their omission, optical drives will be given another small push toward obsolescence. The mockups shown here are beautiful, but I think they’re wrong in at least one other key respect — a touch- and stylus-enabled tablet from Apple would be running a scaled-up variant of the iPhone multitouch interface (Mobile OS X) rather than a scaled-down version of Mac OS X. This avoids the problems that Windows has on Tablet PCs, where traditional Windows interface elements designed for precise mouse control are pressed into service for use with the highly-imprecise fingertip (or somewhat better stylus). Instead, the iTablet would have a new version of the slick iPhone OS X that’s specifically designed for touch input. Controls are sized larger and tasks are logically set up for touch interactions. Gestures for navigation and zooming are fully integrated and intuitive. A pressure-sensitive, Wacom-type stylus might be included as an additional input device, for the artists and graphic designers who would be a key (read “drooling at the thought”) market for such a machine. If Mobile OS X is indeed used, it opens the question of how more-computer-like tasks will be handled. The larger and more capable form factor implies more complex usage scenarios such as editing between multiple documents, and with it comes an increased expectation or desire to do more than one thing at a time. In the iPhone’s paradigm, very few apps are allowed to multitask in the background and, from a user’s perspective, a single task takes over the entire machine at any given moment. Apple will need to figure out a new method for task switching, while still balancing against the device’s more limited battery and cpu resources. Further, Mobile OS X has no user-accessible equivalent to the Mac Finder to manipulate files. While it’s very possible that Apple will choose to keep it that way, a new paradigm for transferring user files onto the system and allowing access within appropriate apps will still need to defined and integrated into the user interface. The searchable hierarchical lists used in the iPhone’s iTunes Store or the Mac’s Spotlight search app may point the way to how this might work, but much remains to be done. In my earlier specifications for an ideal ebook reader, I thought that a 12″ display would be ideal. Now, after using a 12″ Lenovo X61T Tablet PC, a 6″ Sony Reader and a 3.5″ iPhone, I’ve changed my mind. The high pixel density and high contrast of the iPhone’s display allows for good readability at reduced text sizes, and the weight and battery life penalties suffered by the Tablet PC make a smaller screen even more attractive. At four pounds, the the X61T gets to be uncomfortable while reading in bed, for example. A high-pixel-density 5.25″ display — as conjectured by the rumor sites — would provide very usable screen real estate without unduly compromising portability or power consumption. Screen size has other significant implications for the iTablet’s user interface. The virtual keyboard would have room for larger and more widely spaced keys than on an iPhone, but their size and positioning are constrained by the physical reach of the user’s thumbs if the keyboard is to be used in a two-handed, iPhone-style landscape typing position. The bigger the screen, the more necessary it becomes for Apple to develop a smart solution distinct from the simple layout used in the iPhone. Larger screens also open up the possibility of typing on the screen while it rests in landscape mode on a flat surface, more like a traditional (albeit shrunken) computer keyboard than a Blackberry. This usage implies yet another keyboard layout, and Apple would then need to make the machine clever enough to display the right one at the right time. Sensors could detect this orientation similar to the way they currently detect rotation and face proximity — doable, but clearly requiring yet more development. Macs, iPhones and iPods all ship with complete suites of applications that allow the machines to perform the functions that they were designed for, all while showing off the machine’s capabilities. By virtue of its screen size, the iTablet is inherently better suited for reading and editing longer documents (like ebooks) than the iPhone. The latter’s smaller screen is not as well suited for this purpose, and the resulting compromised user experience is probably one reason why Apple has not made reader software a priority to this point. In contrast, the iTablet will be a very able platform for ebook reading, and it’s virtually certain that Apple will create an app to show off this strength. Similarly, a stylus-enabled iTablet would make a beautiful handwriting notebook and sketch pad, and it seems very possible that Apple will create a simple app to show off this functionality. That’s the big question. 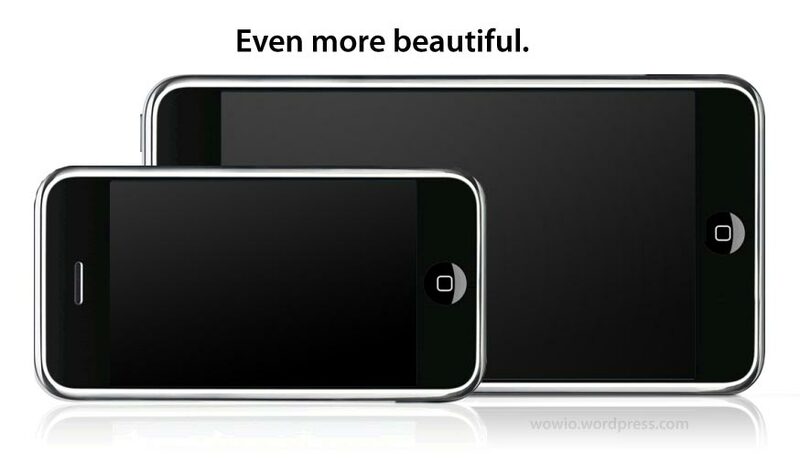 Nearly a year has passed since the iPhone’s debut, and a second generation phone is already expected this year. On the other hand, the issues sampled here suggest that an iTablet is far more than a physical upscaling of the iPhone. Many incremental but still substantial additions and adaptations are needed, and getting it right takes time. I’ve been evaluating different ebook reading technologies over the last months, and I think it’s time for an interim report card on just how suitable the different technologies are for the purpose. My ratings are extrapolated a bit to try to account for the capabilities of a category as a whole rather than any specific device, but it’s obviously an inexact art. I’ll also put out the immediate disclaimer that this discussion is based on a limited sample of devices which aren’t wholly representative of the range of available gear. For fun, though, I’ll even include hypothetical ratings on a machine that doesn’t yet exist — my dream ebook machine, the mythical iTablet or iSlate. This not-so-farfetched device is like an iPhone grown up into a slick, touch-driven, Mac OS X tablet computer. Compatibility refers to a machine’s ability to open ebook files and other documents in various formats. Are proprietary and DRM’d formats supported? Are workarounds required or even available for opening these formats? Form Factor is a qualitative measure of how comfortable the devices are for reading. Does it pass the reading-on-the-couch test? How about the even more rigorous trial of reading in bed? Portability is an indicator of size and weight. Is it something that I’ll want to casually carry around, or will I need to consider trade-offs to save room in my messenger bag or, more importantly, to save my back? Display is a subjective measure of how good the screen is for the purpose of reading. This encompasses hard data like color, screen resolution and screen size, but it also is a subjective measure of how comfortable the reading experience is and how well it renders and displays text. Battery Life is an indicator of how often the device needs to be charged on a typical usage cycle. This includes drain from other uses, so if I typically use a laptop for general computing and use up the battery, this is included in the measure. A dedicated device is, by definition, largely used for a single purpose and thus would have fewer other applications leeching from its usable batter life. Experience is an effort to sum up all of the subjective and sometimes intangible qualities in a single number. This includes the device’s feel in-hand, negative distractions from the reading experience (such as system demands for attention — did someone say “Vista?”), interface usability and even that ultimate example of subjectivity— the fun factor. Compatibility ratings are high for the general-purpose computers, since they can generally handle anything that can be thrown at them. One major exception is the lack of support for some proprietary DRM formats on the Mac. The mythical iTablet would have limited initial support for these formats, but being a general-purpose and relatively open machine, software could be developed for the purpose. The form factor for the tablet PC gains a few points for a large and flexible display, but loses them again for being somewhat bulky compared to a dedicated reader. Conversely, the dedicated reader gains points for svelteness but loses a few for the relatively small screen. These factors are a wash for me, resulting in the tie score. Display ratings for the mythical machine are higher than the other general-purpose machines based on the assumption that it will sport a superior display like that in the iPhone. Text display on e-ink-based dedicated readers like the Sony Reader would be a point or two higher for text read in good light. The lower score in the table reflects poorer performance in marginal lighting conditions. Displays on LCD-based dedicated readers like the iLiad are closer to the ratings for tablet devices. The tablet would rate higher on overall experience if it were just a little lighter and more compact, and if the operating system required less care and feeding. I ding the mobile devices for overall experience because I don’t like reading on tiny screens unless I have to, even given the superior screen and great ebook potential of something like the iPhone. Your mileage on this, like everything else on this table, will vary. I’d like to make this table a living document, updating it periodically as the technologies evolve and adding additional criteria as needed. If you have suggestions for additional measures, let me know. And if you violently disagree with my ratings — or just have your own ideas — I’d love to see your version of the table and the reasoning behind it! Did you ever sit down to a meal with a book that you couldn’t put down? Me too, more times than I can count. I would always have to either eat one-handed or weight down the book with a salt shaker (or whatever dense object I could find close at hand). I sat down to lunch today with the tablet and My Happy Life, and I realized that my meal-reading problems are over! Everyone talks about being able to carry a million titles in one ebook device, but this is real progress! I wanted to enjoy the sunshine on a lazy Sunday afternoon, so I toted the Lenovo X61T to the park to read more of My Happy Life. The day was bright and cloudless, but the Lenovo’s transflective display was clear and beautifully legible. As I sat engrossed by Lydia Millet’s lyrical prose, the Lenovo jolted me with an unwelcome demonstration of the perils of using a Windows machine for ebook reading — the book page was abruptly replaced with the dreaded Blue Screen of Death. The crash came without warning. The machine — which has nothing but up-to-date stock software installed — appeared to be idle, with only Acrobat Reader running in the foreground. I don’t know if Vista, Acrobat or background software like the bundled Norton security software was responsible, but it’s ultimately another example of the unpleasant overhead that Windows adds to the reading experience. I had to wait several minutes for a Vista reboot before I could return to my book. I haven’t used Vista and this machine enough to know if this is an isolated incident, but stability issues on top of other Windows intrusions would definitely push me toward other platforms for my reading — whether a dedicated reader or a return to my Mac laptop. Update: More thoughts on this subject in Vista Nags, Bugs and the Reader’s Experience. The excitement of a shiny new toy in the house has subsided, so the Lenovo has now entered the reality phase with all of its simpler pleasures and niggling disappointments. This isn’t intended to be a comprehensive review of the hardware — I’ll instead cover my ongoing impressions of the machine, from the perspective of a book reader (and design curmudgeon). The real test in using a tablet PC as an ebook reader is, of course, in the reading. In settling down for an extended read, the first order of business is to actually get the ebook open. This isn’t as trivial a matter as it should be. I’m perhaps starting to sound like a bit of a broken record on the issues with Windows overhead, but it’s a key part of the reading experience. When I pick up a print book, I can jump right in and start enjoying the contents. In the Windows Tablet PC world, I have to deal with assorted system and security software updates, Vista “do you really want to launch this program” confirmations and miscellaneous other intrusions far too often at the start of the reading session. Fortunately, Vista’s sleep mode seems to be more reliable than XP’s, so I can at least avoid the lengthy startup process most of the time. I often leave the machine in tablet mode with the keyboard folded away and Acrobat Reader open to my current book (Lydia Millet’s strange but compelling novel, My Happy Life ) in full-screen mode. This greatly simplifies and speeds up the reading process, more closely approximating the spontaneity of a print book. I can wake up the machine, log in via fingerprint scanner, let it go through it’s relatively brief waking gyrations, and my book will be available immediately afterward without having to find the file or relaunch Acrobat. The screen sometimes blinks through horizontal and vertical orientations, as it tries to use its sensor to figure out which way to show the display. About half the time, it gets it wrong, but the hardware button on the tablet bezel makes this easy to fix. Actual reading is a pleasure when compared with other computer-based approaches like desktops or laptops. The tablet form factor is a big differentiator, allowing the machine to handle in a familiar and comfortable way. At four pounds, it’s not as tossable as a Sony Reader, but it’s better than most standard laptops. The unit is noticeably heavier on the side that holds the battery, so the balance in-hand isn’t ideal. At the end of the day, though, it feels quite usable and comfortable for me. The screen is crisp and legible with a reflection-taming matte finish and a very wide viewing angle. In bright sunlight, the screen is still quite legible, though direct sun reflection does force a little angle adjustment. It’s still much better outdoors than any laptop I’ve used. The white background on text has a typical LCD’s blue cast (the photos give some sense of it), but I don’t find it objectionable or uncomfortable. The default screen brightness is set to the display’s maximum. This is quite a bit dimmer than a MacBook Pro’s, but it’s significantly brighter and higher in contrast than a Sony Reader’s e-ink display. In practice, the Lenovo’s screen works very well for reading in a wide range of ambient lighting conditions. I don’t have much to say about the actual experience of reading — and that’s a good thing. Once I get into the ebook, paging feels very natural and the machine is generally unintrusive. One exception — the small, lighted status icons at the edge of the tablet are a little distracting, especially when the hard disk light is blinking. It would be nice if a “quiet mode” preference could be set that would shut down all of the indicators except for a low-battery warning. Better yet, these extraneous lights could be eliminated altogether. They offer nothing useful that isn’t already displayed on the screen (yes, hard drive activity isn’t normally shown there, but I’d argue that it’s useless information anyway). Quibbling aside, I find reading on the X61T very comfortable. It is clearly a very viable platform for digital reading— it passes the Couch Test with just a few caveats. I’ll report back here with more impressions as I get a feel for the long-term experience. Update: More face time with the Lenovo has given me the blues. iSlate: a Mac-iPhone Hybrid Apple on Tuesday? As Apple prepares to make a Mac-related hardware announcement on Tuesday, my thoughts inevitably turn to my dream machine — a potent hybrid of the iPhone multitouch interface and full Mac OS X functionality melded into a sleek and totable tablet. While the scale of the hype around the event likely portends a less-revolutionary change (i.e., a major revamp of the iMac), I can still hope that the new machine(s) — whatever they might turn out to be — will give some hint of future fusion of the now-branched lines in Apple’s evolutionary tree. Apple’s patent filings are already strongly hinting at such a machine, one that will finally bring life (with no small irony) to Bill Gates’ unrealized vision for tablet computing. My initial experiences with the Lenovo X61T Tablet PC show that the concept is solid — the machine is powerful enough for day-to-day computing while providing a uniquely-useful form factor for tasks like ebook reading, drawing or light web browsing. Where it stumbles is in its interface. The Vista touch implementation still feels like a superficial and inadequate layer on top of a fundamentally mouse-centered paradigm. I find myself constantly having to switch between fingertip, stylus and keyboard to get things done. A more deeply-designed touch interface — like the iPhone’s — minimizes such discontinuities. Tasks flow fluidly and naturally, and the user is shielded from the underlying machinery whenever possible (good-bye, Vista confirmation screens!). That’s the real magic that makes the iPhone special, and I’m looking forward to using it on a future multitouch Mac. Update: Apple has announced major upgrades to the iMac, Mac Mini, iLife, iWork and .Mac. No iSlate or iTablet… yet. 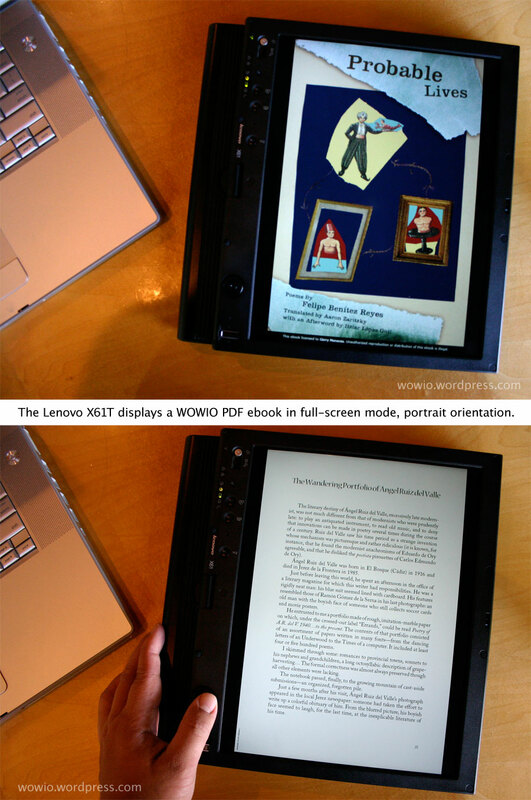 As computer users migrate toward portables and revolutionary interface concepts like the iPhone drive renewed interest in touch screens, the Lenovo X61T — a nicely-equipped Windows laptop with a 12.1” screen that converts into a stylus- and touch-driven tablet — represents one evolutionary path that may eventually breed the long-awaited killer ebook reader. Such a device would finally enable the often-predicted but still unrealized revolution in the mainstream reading experience. In this context, I’ll take a first look at this machine and its capabilities as an ebook reader, touching on its laptop functionality only insofar as it affects that application. This tablet shares the strengths and weaknesses of any Vista laptop, with the added wrinkle of the touchscreen and the grafted-on Windows touch interface. As such, it has the tremendous advantage of being able to get on the Web to access content directly, whether web-based books or downloadable content like that from WOWIO. Unfortunately, it also means having to deal with a seemingly-endless parade of Windows intrusions just to get to the content, from security updates to excessive Vista confirmation requests. Unlike the iPhone, the interface was not specifically designed for touch interaction, so many of the interface controls (like closing windows) were too small and ill-positioned for touch control, even after recalibration of the touch screen. I often had to resort to the stylus to get the required precision. The hardware itself is very nicely designed. Even with the larger eight-cell battery (theoretically good for seven hours), the machine is light and readily held in one hand while in tablet mode. A small ledge with a rubberized grip provides an additional area for maintaining a secure and comfortable hold. In my initial usage, its light weight and compact form factor felt quite comfortable for casual ebook reading on the couch. The last is a surprisingly useful addition, allowing a quick login into Windows with a finger-swipe in tablet mode without the hassle of switching to the physical keyboard in laptop mode or using the onscreen keyboard or handwriting recognition. The rocker switch functions are user-definable, but in Acrobat Reader it defaults to simple and intuitive forward/back paging controls. The screen orientation button quickly rotates the display, allowing an optimal view for either individual ebook pages in portrait or two-page spreads in landscape. I started my reading with some relatively light fare — the comic book Abiding Perdition (below). I initially viewed the comic in landscape mode, as a two-page spread. Unfortunately, Acrobat Reader’s full-screen mode (which blanks out all screen content except for the current PDF page) is not available with this setting, so I could only view it in reading mode (which reduces Reader’s screen clutter but wastes some space by retaining the Windows task and title bars). At this magnification, some of the text in the comic book was legible, but a little small and fuzzy for comfortable reading. Rotating it to portrait mode did not allow viewing of the comic’s natural two-page spread, but the text became very legible and the high-resolution artwork was reproduced with great detail. The reading experience in full-screen portrait mode was terrific — the compact tablet form factor mimics much of the experience of reading a print comic but with the bonus of having exceptionally brilliant artwork that leaps off the page, literally glowing with vibrant color. I next read the poetry-novel Probable Lives (pictured at the top of this post). Here, a two-page spread was unnecessary so I went immediately to full-screen portrait. The text and layout are beautifully rendered, with the look of a “normal” printed page with slightly enlarged text. The size was comfortable for my corrected vision, and likely to be legible for those with some vision impairment. A single touch tap on the screen was the equivalent of a mouse click, which in Acrobat pages the book forward. The touch taps seemed a bit finicky though, requiring a specific touch duration. I found the rocker switch to be more reliable and flexible. All in all, this all-text reading experience was also excellent, providing a much more natural and book-like way to view the ebook. While this initial glimpse confirms my expectation that a tablet-like computer would make an excellent ebook platform, a longer-term trial is needed to fully evaluate the reader experience. This will show the effects of additional concrete qualities such as battery life and display visibility in daylight, but it will also give a surer sense of the intangibles that can make reading a chore or a pleasure. Update: Read novelty-has-worn-off impressions of the X61T.